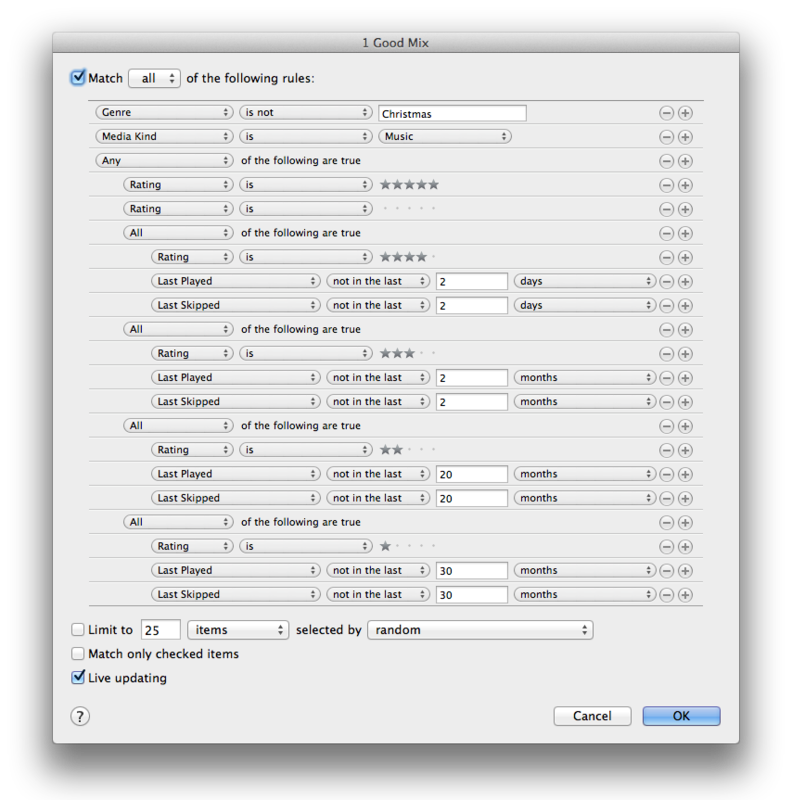 Back in 2009, I posted an article titled “Keeping your iTunes Library Fresh” that showed how to create a smart playlist that would improve over a simple shuffle of your music library. Based on your ratings, it would play the music you like more often than the music you like less. The playlist needs to be refactored so that it doesn’t depend on other playlists. Adjust the time values to your preferences. The reason why the no-star ratings are given equal weight as the 5-star songs is that it is likely that it is music that you just purchased and thus want to hear it frequently until you make a decision on what other rating you want to give it or it will help encourage you to rate all of your music. If you have a ton of unrated music simply make a zero-star-rated playlist and work your way through it. This entry was posted in iTunes and tagged iCloud, iTunes, Match, playlist. Are you getting bored with shuffle? Are your 5-star songs getting overplayed? Do you want to hear some of the old songs from time to time but not too much? The remedy is to create a “Good Mix” smart playlist and here’s how! 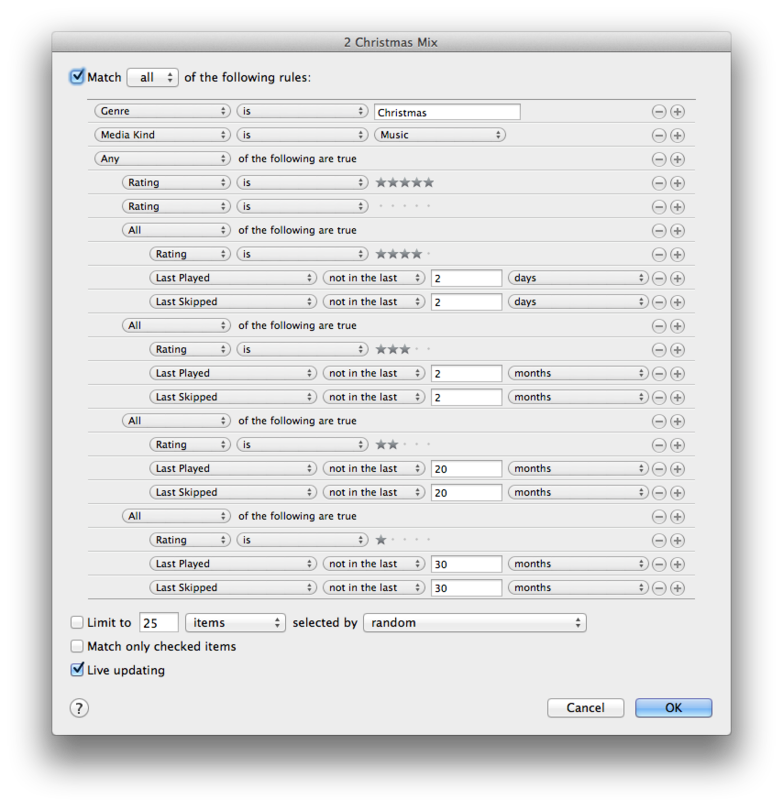 You don’t need iTunes 9 to do this but the steps are much simpler in iTunes 9. It introduces a new grouping feature for smart playlist rules. Unfortunately, even with these new grouping abilities, there are still things that cannot be achieve without nesting playlists. You’ll need to create a total of 6 smart playlists–but don’t worry, it will be worth it! This smart playlist will be the basis for all of the other smart playlists that we will be creating. The goal of this playlist is to filter out files and genres that won’t be everyday music files. For my tastes, this means “Classical” and “Holiday” music won’t be on my normal listening schedule but feel free adjust this as applicable to your tastes. This smart playlist is also a building-block playlist that will be consumed by another smart playlist. This smart playlist is the final playlist and the one that you will be listening to. Now that all of the playlists have been created, you are almost ready to play music. If your music tastes change, be sure to change the rating of your songs! If a song feels overplayed to you? Knock it down a star. Is an old gem coming back to you? Give it some extra stars. This entry was posted in iTunes and tagged iTunes, playlist.